Gorgeous, and very rare silk shantung wedding gown from the 1950s! I have never seen one like this before! 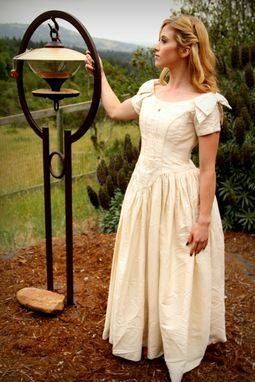 The bodice has princess seams throughout like a corset, giving tons of hourglass shaping throughout the torso and bust. The dress was a tad big on the model. The sleeves have big double bows of silk shantung with floral embroidery on them at the top of each shoulder. 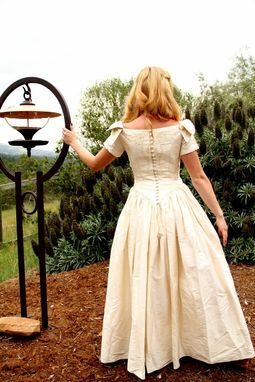 The bodice is embroidered like a renaissance princess's dress! The waist dips low in front and back to elongate the waist and emphasize hourglass hips. The back of the dress buttons up with silk covered round buttons. The dress is in absolute perfect, mint condition! There are definitely no stains, rips or tears anywhere on this beauty. Label Reads "Allison Bake"